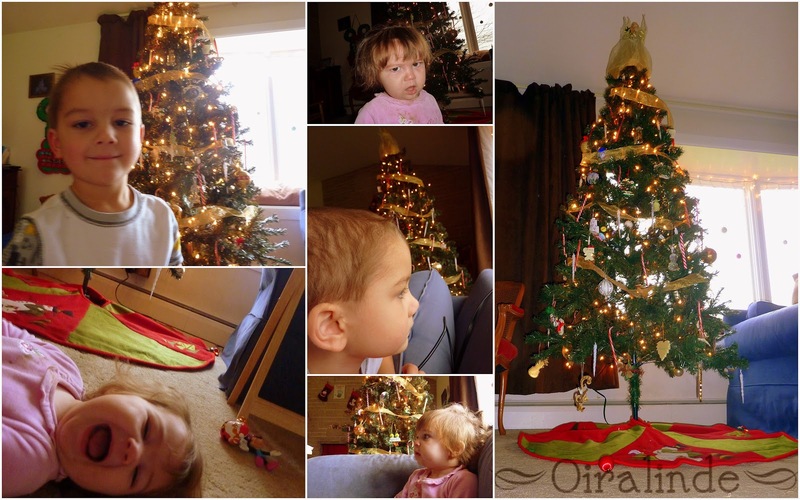 There are many schools of thought on decorating Christmas trees when you have a one year old in the house. When Sebastian was younger I had him help me. He decorated the tree with me and then left it alone for the rest of the season. I did the same thing this year with Kaelyn. The tree has been up and lit for a week or so, but I was very lazy in finally getting the decorations on the tree. Today Sebastian and Kaelyn helped me decorate the tree. Sebastian's jobs were putting on the candy canes and the icicles. I showed Kaelyn how to put the ornaments on the branches and then I gave her the non-breakables. She wanted to help long after Sebastian lost interest and was playing with a communicator ornament that made noise. She did a great job and once the tree was finished she left the tree alone, jut like her brother did a few years ago. The tree was heavily decorated on the bottom front, so after the kids were eating their lunch I moved a few of the ornaments to make it a bit more balanced. It still has the feel of a kid-decorated tree and I love it. The next task is to make the gingerbread house! Unless I am tickling that girl, she makes a stank face at the camera.